Designed for extremely weak signal areas. The AP-8275 is recommended for use when TV transmitters are at least 60 miles away. Add-up the total amount of signal decibel loss that will occur as the signal travels from the TV antenna to the TV with the longest cable run. 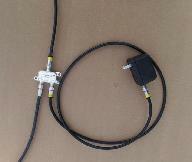 Add the signal loss from the cable length and any splitters between the antenna and the TV. Choose the amplifier with the dB gain rating that is from 5 to 10dB greater then the total loss. EXAMPLE: 100 feet of coax cable and a 2 way splitter have a signal dB loss of 8.7 dB. Also VCR's and other such devices that the signal travels through create minor signal losses. A perfect amplifier match for the above example would be the Winegard AP 8275. The 8275 amplifier has a gain rating of 28dB. Note: In Southern NH we are using these high gain amplifiers. Your location may be different and a lower gain unit may work for you. Typically the output of the mast mounted antenna is sent to a power splitter for distribution to the televisions in your home. Some splitters have a distribution amplifier built in to reduce loss and some do not. You may need to juggle your distribution equipment in order to get the proper amount of signal to your TV's. My packages are designed for rural areas where the transmitters might be more then 50 miles away. If you need something custom, just ask for a quote.